I’m just trying to understand something - if you have an 8750 with a 39 multiplier and a 45w long power limit, you’re basically guaranteed to see power throttling, correct? 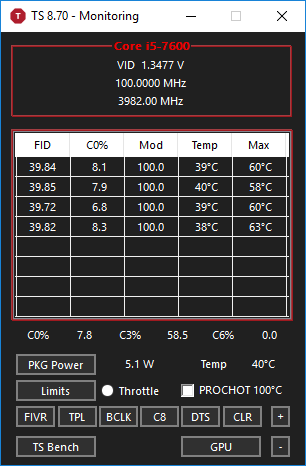 Hello, why does my PC not allocate all of it's processing power? It's supposed to go up to 2.8 GHZ turbo boosted but it stays at 2.6. Why is this? Also the multiplier is at 99.768 instead of being 100 mhz and i don't know how to change it. I have clock modulation and set multiplier on max. How can anyone answer your question if you do not provide a screenshot or even your CPU model? I checked your 2 previous posts and they did not contain any information either. The multiplier is not 99.768. That is the BCLK and somewhere close to 99.768 MHz seems to be a typical value for many laptops. A perfect 100.0000 MHz would be nice. I can do that on my desktop but not on my laptop. Not sure why. The difference is not significant and can generally not be adjusted on a laptop so it is what it is. Clock modulation is rarely used on any recent Intel CPUs so I am not sure why you have that checked. Set Multiplier is also not used on recent laptops if Speed Shift is enabled so you might not need to check that one either. Post a screenshot or two of ThrottleStop if you need some help. Here is what a perfect 100 MHz BCLK looks like in the wild. @scarletfever - Different applications use a different variety of CPU instructions so they will load the CPU differently. An application that uses the AVX instructions will require significantly more power compared to the same application that does not use AVX. Perhaps a low stress app can run at the full 39.00 multiplier on your 8750H while staying within the default 45 Watt power budget. On the other hand, I know for a fact that there are high stress applications like the Prime95 Small FFT test that will shoot a giant elephant gun sized hole in your power budget. No way will your 8750H be able to run 12 threads of Prime95 while only using 45 Watts. My simple advice is run your CPU as fast as possible as long as it is not overheating and the fans are not driving you crazy. A CPU is an inanimate object. No need to baby it or keep it at some sort of perfect temperature. The only one thing I did was install XTU, saw the voltage controls greyed out there and uninstalled it. This sounds like a conspiracy of some sort. I have no idea why your turbo multipliers and voltages were locked. I hate to bash the competition too much so thanks for providing users with a reason not to install XTU. "Open up the Turbo Power Limits window and set the Package Power Long to 52 Watts, Package Power Short to 70 Watts and set the Turbo Time Limit to 28 seconds. In this section, make sure to clear the Clamp option. That is a throttling method that can kill performance. You can also adjust the PP0 Turbo Time Limit to 28 seconds. While you are in this window, check the Speed Shift option, hit Apply and then set the Min to 8 and the Max to 41." Should the clamp option be disabled for both short and long? My long clamp is checked on. I can run anthem at -.137 but I can’t get past the initial loading screen of BFV without a BSOD. ton of coil whine too, but only during initial loading screen. I haven’t bothered increasing wattage but I’ve been experiencing the same. I can’t wrap my head around why intel would do this lol. When do the 28 seconds start again? Ie how often can the cpu be in PL1? I might be wrong, but I think the timer starts once the power consumption crosses 45w and will reset as soon as it gets below the limit. I would like to hear more about this from other people around here. Does undervolting cause the CPU speed to go lower when under max load? I'm noticing it's not going to full speed when it's undervolted with throttlestop. I get around 2.7 GHz when it normally goes to up to 3.3 GHz. What other changes did you do? Post some screenshots of how you've set up TS to allow unclewebb and others to be able to diagnose this for you.